While reading a magazine, my eyes were glued to a question. “What are your best money-saving travel tips?” I stopped for a while and started to think about the best money-saving tip I can consider. 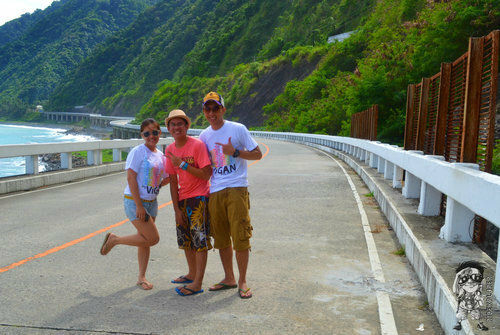 Together with new found friends Marvin and Velle in Patapat Viaduct, Pagudpud. The first thing I thought was sharing the tour with other tourists, this usually applies when you’re in solo. Touring around north of Pagudpud is via renting a tricycle and since I’m in solo, the 600 rate is a big chaos to my budget. In Laoag City, I overheard a couple asking locals on how to go to Pagudpud and check the attractions. I approached them and asked if they want me to join them on the tour, they agreed and I saved 400 from my budget and at the same time, I found new friends! Ever wonder what other travelers do to save some of their travel funds every time they embark on a trip? 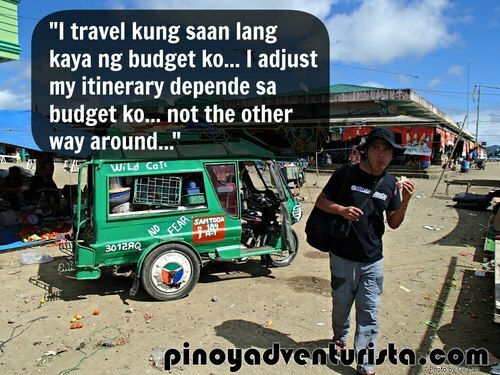 Here are some of the answers I got from fellow Pinoy Travel Bloggers. 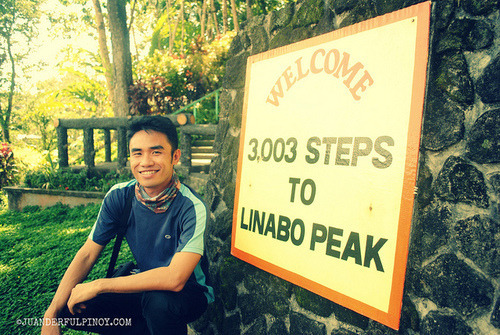 Chino in his visit to Linabo Peak in Dipolog City. Research is a must! By researching the places and destinations ahead of time, you’ll be aware of the lowest and best deals on hotel accommodation, transportation, and food that would also include the great free things your destination has to offer. Research and ask locals. Always wear a smile because friendships come along and sometimes the perks of having freebies like food and discounts on accommodation. It is also best to commute and skip “pasalubong” shopping. Sometimes, in your efforts to save money, you’re not aware that those all day bus and/or train fares add up and could be much more expensive than if you just rented out a car. This usually plays in when you’re in a group. Research. Because when you research, you can have and plan your itinerary. Also, plan the sequence of places you need to visit, it will save you a lot of money and time. Unplanned trips are not for budget traveling. I adjust my itinerary depending on my budget, not the other way around. Be friendly! I’ve had lots of trips wherein I stayed at certain places for free coz I met travelers on previous travels and stayed in touch so if I’m in their area, they’re more than happy to host and show me around! Ask a tourism officer, barangay tanod, policeman, or anyone from LGU about the real prices of fares, tours, etc. Sometimes, opportunistic drivers, locals, tour operators take advantage of you being a tourist. They usually think that you don’t know about the local prices, so they jack up the rates. Getting information about rates from the LGU will “shield” you from lies and opportunism. And if you resort to haggling, you can come up with a better decision of what should be a reasonable rate. Know a local, be sincere and friendly. Sometimes freebies come after like free tour, accommodation, treats, and most of all priceless friendships. Best to stay with locals, your stay is not only free; they can also point out lesser known attractions which may be cheaper than well-known ones, but just as good. You can find these locals either through Couchsurfing, or your FB fan page. I’d stayed with people I met through my blog on my trip to India recently. 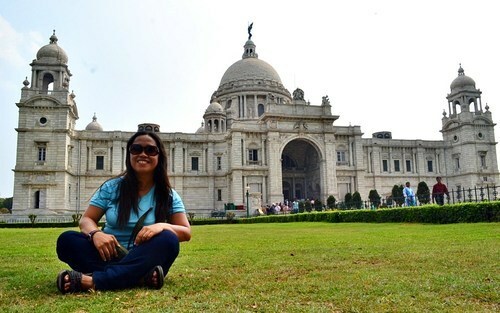 Aleah at the Victoria Memorial in Kolkata, India. There’s nothing so bad about trying hostels, local carinderias, and buses, cheaper and higher chances of making friends. I always volunteer to teach English or help NGO health workers like Vietnam and Cambodia, they usually offer free accommodation, food, and most of the time, tours. Locals that you get to help will offer the same just to have you a day or two in their house; they just want someone to talk about practicing their English. They’re everywhere in Cambodia and Vietnam, just ask the hostels and hotels or even motorbike taxis and they’ll hook you up with the NGO’s. Cup noodles and bread for breakfast. Eat a heavy breakfast and share expenses if in a group. Smile because you might meet someone who can be helpful along the way like free rides and others. I have a no cab policy. I always commute! James enjoying the waves of Zambales. Don’t be “maarte”. It is the start of luxury which results in greater expenses. Pipe the eff down and do not run around from place to place. There is value is slow (lazy) travel. Check hop-on, hop-off tours or cheaper fares or buy subway cards. Bring your own water bottle to avoid buying bottled mineral water. Always refill it in carinderias, hotels or restaurants. Hopefully, the tips shared by fellow travelers will help you save some from your funds in traveling and seeing the beauty of the Philippines and the world.